I’m pretty sure that none of you will have guessed that the answer is adhesive paste. Or more specifically Coccoina Adhesive Paste, as sold by Bureau Direct. I included a tin of this in a recent review order and to be honest it’s sat there on my desk looking incredibly cute for a while now. So much so that I almost didn’t want to open it and stop it just looking sweet in any way. But last week I got my Cricut machine out again and when it came to sticking some things I had cut onto cards I reached for the Coccoina instead of my usual glue stick. 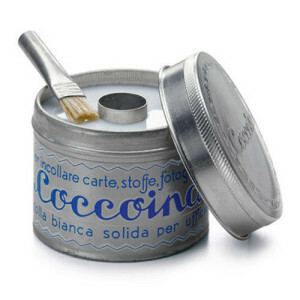 The Coccoina worked really well as a glue. It was easy to spread using the little brush that comes with it (and with a finer paintbrush that I used for some very fine pieces) and everything stuck on well and has remained as such when the paste dried. As if the cute tin isn’t enough of a reason to buy this glue, it’s also made from potato starch making it non-toxic and safe for kids. Even better still is the fact that it smells deliciously of almonds. So good that whenever I open the tin and I want to eat it! In my mind there’s no wonder that that it was number 33 in the Independent’s Best 50 Stationery Items. Disclaimer: I was sent this Coccoina Adhesive Paste to review as part of my work with Bureau Direct. All opinions are my own.